I remember not too many years ago I would pack my tiny beach bag with my sunglasses and sunscreen and be on my way…now I have a toddler. Which means I need to pack everything I could possibly need for any situation that I might encounter on a beach trip with toddlers. So what do I pack for a beach trip with toddlers? Here is my list! Snacks- I will pack sandwiches for lunch and other hydrating snacks like sliced fruit. Drinks– Water, water, and more water. It’s so easy to get dehydrated at the beach so make sure you and your kiddos are drinking water! Hats– To keep the sun out of their eyes and prevent sunburns on their face, ears, and neck. Umbrella– Everyone will need a break from the sun eventually. Water shoes– The sand can get extremely hot! Some beaches also will have sharp shells that might bother your toddler’s feet. Large beach towels– For both drying off and laying on the beach. Aloe vera– In case of sunburn. Other outfits- For dinners or hanging out at the hotel. Don’t forget to pack double the clothes if you don’t have a way to wash outfits. Toddlers have a tendency to be messy! Light jacket- Evening beach walks can get chilly. Bath supplies- Toothbrush, toothpaste, hairbrush, and travel bath washes. Playpen- If your toddler doesn’t sleep with you. “Lovey”- If your toddler has a blanket, pillow, or stuffed animal that they are attached to you better not forget it! Baby monitor- If they aren’t sleeping in the same room as you. First aid kit- Teething medicine, band aids, fever medicine, or anything that will prepare you for an emergency. We have a small make up bag filled with things like this that stays in our daughter’s diaper bag at all times. 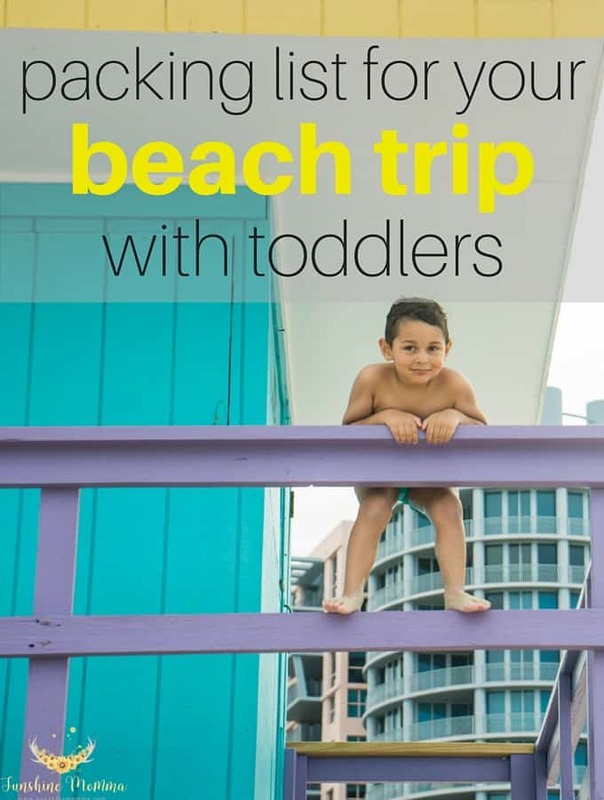 What do you pack for a beach trip with toddlers? Awesome article, we have taken our 1 year old to the beach a few time and he loves it. One additional thing I found helpful was using a fitted sheet to put everything on. When you put your cooler and bags in the corners the sides keeps most of the sand out and makes an easier place to lay your little one down for a nap or to change a diaper.